- At 7am elements of three regiments of the German XIV Corps attack French positions on the Lorette Spur north of Arras. Advancing in the wake of the detonation of several mines, the German infantry push forward six hundred metres and occupy the French trench line, taking eight hundred prisoners. - Despite agreeing to the deployment of the January reserves to the Eastern Front, Falkenhayn remains convinced that victory can only be achieved through a successful and decisive offensive on the Western Front. To date, the issue for Falkenhayn has been finding the forces to undertake such an operation - the portion of the German army currently in the West is sufficient only to defend the current line, while Hindenburg and Ludendorff jealously guard their units on the Eastern Front. However, on February 22nd Major-General Ernst von Wrisberg, director of the General War Department, had submitted a proposal to Falkenhayn that offered the prospect of creating a new reserve force that could be utilized in major offensives. While sufficent new recruits have now been trained to form several new reserve corps, as had been done in October 1914 and January 1915, Wrisberg's proposal was to instead to assign approximately 2400 recruits to each existing division while simultaneously detaching one regiment from each division. The detached regiments, meanwhile, would be combined into new reserve divisions. Thus unlike prior occasions, these new reserve divisions would be comprised of experienced soldiers capable of undertaking complex operations. Wrisberg expected that this reorganization would allow for the creation of twenty-four reserves, and Falkenhayn has eagerly embraced the proposal, seeing in it the means by which his desired offensive in the West could be undertaken. Orders have already been issued for the formation of the first six of the new divisions, and today Falkenhayn orders the formation of a new 11th Army, which he intends to use as the core of his offensive on the Western Front. Its commander will be General Fabeck, who brings to the position his experience in the fighting around Ypres in October and November, while as Chief of Staff Falkenhayn appoints Colonel Hans von Seeckt, an experienced and successful staff officer on the Western Front. - Meanwhile, this evening Falkenhayn arrives at the headquarters of 3rd Army in the Champagne to discuss the ongoing French offensive. He emphasizes the importance of not yielding an inch of ground, which corresponds with the opinion of General Einem, 3rd Army's commander. - In northern Poland the German 8th Army has failed to make any progress in its siege of the Russian fortress at Osowiec. The land around the fortress is marshy and criss-crossed with streams, slowing the movement and deployment of German heavy artillery, while Russian maneouvers outside Osowiec have kept the Germans off-guard. Thus the Germans have been unable to bring their full firepower to bear on the Russian defences, in contrast to sieges at Liège and Antwerp earlier in the war. Frustrated, and challenged by the strength of the Russian 12th Army to the west, 8th Army abandons the siege and withdraws to the northwest. 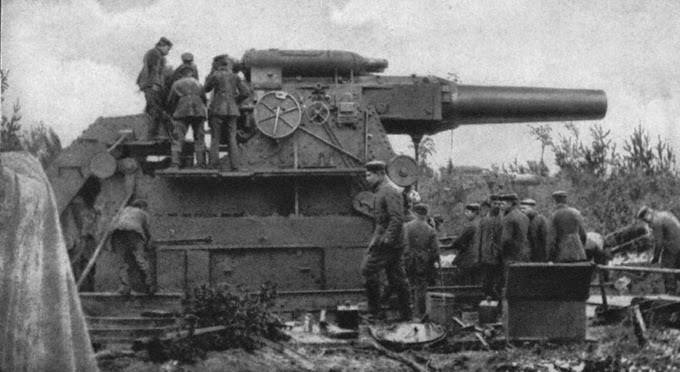 A siege gun deployed by the Germans at Osowiec. - Over the past two days the Russian VII and XII Corps have undertaken fierce counterattacks against the left flank of 2nd Army and the right flank of 3rd Army opposite, but the Austro-Hungarian defenders have managed to hold their positions. From Conrad at AOK comes renewed exortations, urging all armies to advance in Galicia and relieve Przemysl. To the German command staff of Südarmee, given the heavy casualties and terrible weather, such pleas appear little more than delusional. - Another attempt to sweep the Ottoman minefields in the Dardanelles fails tonight when the minesweepers yet again retreat under heavy fire. Significantly, Admiral de Robeck, commanding the forward assault forces of the Entente fleet, concludes today that the straits cannot be forced until the shore batteries are silenced by the occupation of one shore or the other. - After four weeks in Sanaa, the sailors of Emden's landing party have sufficiently recovered from their various ailments to allow for the column to depart today. Their destination is once again Hodeida, from which they had left on January 27th; with a march overland ruled out by the climate, First Officer Mücke has resolved to attempt to continue their journey by sea. - The detachment of Indian Expeditionary Force D sent to Ahwaz on February 11th is encamped across the Karun river from the town. The scratch force has arrived too late to prevent hostile Arabs from cutting the vital oil pipeline to Abadan in several places, ostensibly the detachment's original mission. Moreover, a large number of Ottoman soldiers and Arab irregulars have gathered to the north at Ghadir, and the commander of the detachment has decided to attack the enemy encampment at dawn. His plan is to bring his artillery pieces within range of the enemy, at which point their high rate of fire would induce the Ottomans and Arabs to retreat or disperse. When the shelling begins, however, the enemy came 'buzzing out like a disturbed wasps nest' and, instead of retreating, attacked the British column. The latter was then forced to undertake a fighting retreat, only escaping destruction due to the unwillingness of the Arab cavalry to close up to the British lines and the steadfastness of the Dorsets infantry. - The captain of the German light cruiser Königsberg receives a wireless signal, via the transmission tower at Windhoek in German South-West Africa, that he should communicate with the disguised merchant ship Rubens on April 1st.